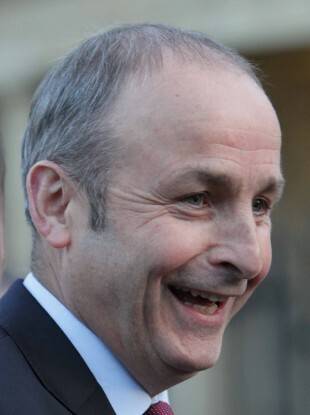 Micheál Martin is the most popular leader of a political party in the country right now, according to poll. A DIFFICULT WEEK for majority-led government party Fine Gael has just been crowned by a new poll which puts Fianna Fáil 11 points clear of FG. The Sunday Times/Behaviour & Attitudes poll puts Taoiseach Enda Kenny’s party at 21%, down 2 points from late January, while Fianna Fáil has surged ahead by 3 points to 32%. The 11-point differential is the largest gap between these two parties in the six years since B&A began polling them. Worryingly for Fine Gael, polling for this latest snapshot ended on Wednesday, 8 February – the day Brendan Howlin used Dáil privilege to elaborate on allegations around the treatment of Garda whistleblower, Sergeant Maurice McCabe. The poll will add to the pressure on Fine Gael and fears of a snap election piled on by the furore around the McCabe case this week, and the call by Sinn Féin today for a vote of no-confidence in the government. According to this latest poll, Sinn Féin have also added to its popularity and there is only a two-point gap between itself and Fine Gael. The same poll shows Micheál Martin pulling away as by far the most popular leader of a political party – at 53 (+4), with Brendan Howlin and Gerry Adams on 39 each, and Enda Kenny adding a point since the last poll but languishing at 30. It should be noted that the last poll undertaken on public preference for political parties was not nearly as dramatic news for the main groupings. The Red C poll published in the Sunday Business Post on 29 January still had Fianna Fáil ahead but at 27%, and Fine Gael just three points behind at 24%. Sinn Féin was at 14% in that poll. An IPSOS/MRBI poll for the Irish Times on 8 December last had FF at 30%, FG at 27% and SF at 17%. Email “Fianna Fáil has an ELEVEN point lead over Fine Gael in opinion poll”. Feedback on “Fianna Fáil has an ELEVEN point lead over Fine Gael in opinion poll”.